We know rather more about painting from the 4th century B.C. than from earlier periods. This is partly because a handful of compositions have survived on grave monuments, chiefly in Macedonia. A recent view persuasively makes the frescoes on the Persephone tomb at Vergina the work of Nicomachus, a leading 4th-century painter. We also have a fair number of painted tomb stelae, from Vergina itself and from Demetrias in Thessaly. 4th-century representations were very fashionable, and were copied over and over again in the following centuries. 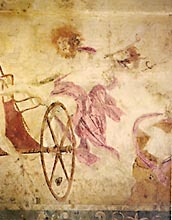 Some of them are familiar to us from the wall-paintings at Pompeii. Even from the indirect evidence of the copies, we can appreciate the success and stylishness of major Hellenic painting. Lastly there was vase-painting, which continued to provide information about new developments and choice of subjects in major painting. Our most eloquent examples are pots in the Kerch style and pots from Southern Italy, where a good deal of use is made of applied colour. Painters continued to use chiaroscuro through the 4th century. One example was Pausias from Sicyon - though he achieved his effect by intelligent colour combination. He managed even to convey the transparency of glass (so Pliny tells us), in a picture on the subject of 'Drinking'. Another leading painter of the early 4th century was Timanthes. 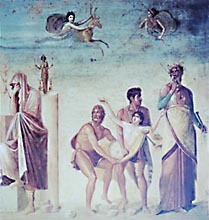 His most famous picture was 'The Sacrifice of Iphigenia at Aulis'. It was generally pictures of myths that made the most noise. But there was also some 'historical painting', for example 'The Battle of Mantinea' by Euphranor - also a distinguished sculptor - and 'The Battle of the Greeks and Persians', attributed to Aristides son of Nicomachus the painter. Apelles from Ephesus seems to have been particularly fond of allegorical subjects - he did a painting with the personifications Scandalmongering, Spite, Ignorance, Graft, and Truth. Apelles is also credited with great virtuosity in trompe-l'oeil painting. But what he was most famous of all for, was his precise and delicate linework. Pliny records an anecdote about a competition between him and Protogenes. Apelles won by drawing a line so fine that his opponent gave up in despair.